In a mason jar combine garlic, dill, white and apple cider vinegar, salt, bay leaves, fennel, sugar and water. Allow to sit until sugar is dissolved. 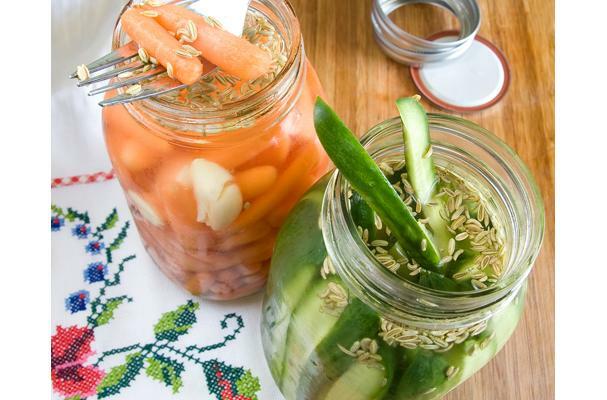 Place cucumbers inside mason jar and seal. Refrigerate for a minimum of 5 days before serving. N a mason jar combine garlic, dill, white and apple cider vinegar, salt, bay leaf, fennel, sugar and water. Allow to sit until sugar is dissolved. Place carrots inside mason jar and seal. Refrigerate for a minimum of 5 days before serving. Today is a sad day for Canadians. Why you might ask? After five years Stephen Harper and the Conservatives finally got their majority government. Now I know this is not a political blog but when I’m upset I cook. I cook a lot. So much that I could probably feed every Canadian that greeted their palm to their face last night at 11pm. Despite the outcome there are a few positive things that came out of this election. Quebec proved to be in solidarity with the rest of left wing Canada and voted in favour of the NDP over their usual choice of Bloc Quebecois. Young voters also flocked to the polls displaying both their power and their desire for a country that represents their views. Because of this The New Democratic Party is now the official opposition party and Elizabeth May of the Green Party got her seat in the house. These are things that can be celebrated. So what the heck do refrigerator pickles have to do with the Canadian election? Well, the colours. I have decided that for the rest of the week I will celebrate the NDP and Green Party’s small victory and only cook foods that are green and orange. I know, I’m insane.